In this game you will play a powerful wizard that and you are the last man standing. 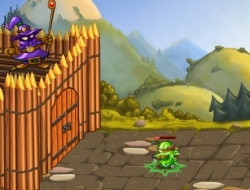 The mission is to defend the castle in this action game and destroy the robots with magic, which is their only weakness. Make sure you will use your spells at the right time to destroy them. There is a number of days you need to defend the castle so give it your best shot. With each kill you will be rewarded with diamons and you can upgrade your spells, increase the castles health and your energy as well. Find a good balance in your build and keep the attackers far away from the walls or they will destroy it in a blink of an eye. Upgrade your spells for more damage but keep in mind that your energy needs to be refilled and it costs. Use the mouse to aim your auto attacks and use QWER as your magic skills. Tech and Magic 0.00 between 0 and 10 based on 0 votes.